A couple weeks ago I had the wonderful opportunity to be a visiting artist at the School of Visual Art and Design at Alfred University in upstate New York. For a moment I thought I was on my way back to Greece (photo below?!) via an unexpected route! I performed Sanity Ceremonies, did some teaching, gave a formal lecture (yikes!) and got in a wee bit of research for new projects. Danny Davis, my beloved lighting designer/tech director/co-conspirator arrived with bundles of gel and made the magic happen. We worked dawn to dusk! 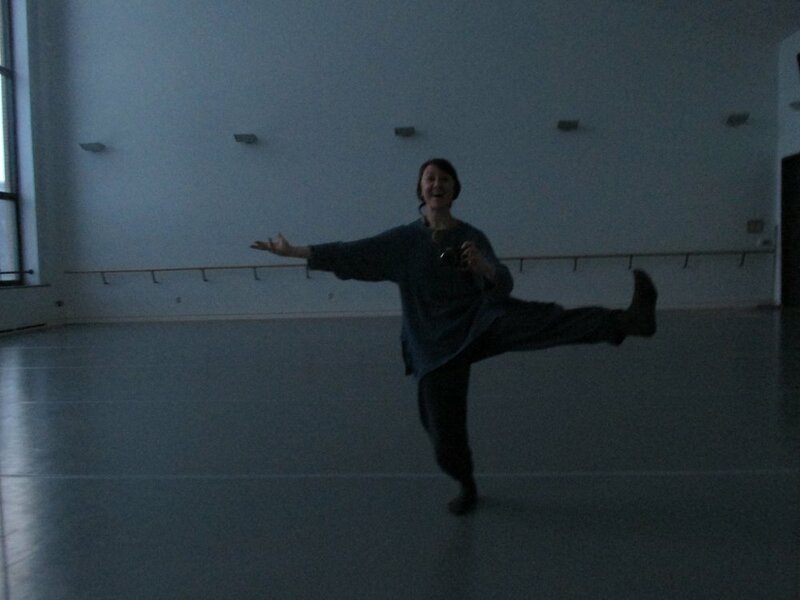 Teaching composition to the dance students was a highlight, and rehearsing in gorgeous studios looking out over white mountains was a dream come true for my southern soul. Lots of gratitude for new friends, lovely hosts, hanging with my dear collaborators, and for dance taking me into deep snows and new territories. I'm clearly not engaging this blog with regularity. I've been in a period/process of knowing a big download of new learning was taking place. Feeling like an overhaul was coming in terms of how I think of "my work" and communicate about it. This period has yielded some outward silence, as I've allowed focus to go toward the doing and not the sharing about the doing. But I'm in process (whew! --admin is it's own beast!) now of figuring out how to shift and update this site in order to reflect a desire to share some updated findings. I've made a couple changes. You might come upon some new and more strident language on my "mission and process" page. Do I even want to call it MISSION AND PROCESS?! It's all up in the air. Alert: I might be starting to sound, errr, weirder. It's because I'm trying to get more and more to the root of things. To center around my values and discoveries in freer, more pointed--and hopefully more potent--ways. No need to be nice. No need to beat around the bush. I'd rather be robust than nice. Rather merge with the bush than skirt round. We'll see. Been thinking about what we're hungry for. What we need. As people, as a culture, a country, a world. Been working to continue to hone the skills and do the research that will allow me to contribute something of meaning, something that's got legs to stand on. It takes TIME to make SUBSTANTIAL things, doesn't it? It goes so far beyond stringing together some high kicks and special moves. It's a study, a discipline, a sacred practice to craft things that can hold sturdy when the weather gets wild. What have you come across lately that is of substance? What's holding water? What is bravery looking like to you? Meanwhile, messing with costuming for Sanity Ceremonies to be re-staged at Alfred University in the Spring. The Gem n' I trailer! Big thanks to Bob Finkelstein who crammed himself into tiny corners and stairwells to shoot sassy angles of our little living room dance. We're dancing hard over at Chi Movement Arts Center, headquarters for Kun-Yang Lin/Dancers. "HOME/S. 9th Street" premieres at FringeArts Nov. 19th-21st! Movement research for Gem n' I at the Icebox Project Space. I'm home in Atlanta for a few weeks and dipping into the archives of past projects. HeadFirst to UpsideDown was the first piece I made after college, and after recovering from shoulder surgery, and it has a sweet sweet spot in my heart. It marks the moment of my artistic homecoming to Atlanta, after living in Philadelphia and Greece, and it marks the moment that my gratitude for being able to dance at all overcame my just-out-of-college timidity and fear around what I would make/if it would be any good/what people would think. I really had no idea what my work even was or wanted to be at that juncture, and I felt distanced from myself as a dancing person after sitting around with my arm in a sling for so long. But when the sling finally came off... I JUST HAD TO MAKE A DANCE! So I reached out to my friends. Some were dancers, some musicians, some folks who I thought were talented gems of people who would be game for A Fun Process. It's clear from watching the footage that I dressed everyone in a kind of found-object-sculpture-meets-childhood-dress-up-bin, bless their hearts. Then tossed into the soup an adult sized tricycle (found on the grounds of WonderRoot Community Arts Center where I was interning at the time), a liberal sprinkling of tambourines, house lamps, a clothesline, a number of leaves and branches--and is that a black mesh citrus bag on Holly's face?--and wrangled together a first attempt at a dance theater performance conglomerate. And it remains one of the MOST FUN THINGS I HAVE EVER DONE. I giggle and sigh when I think about it. What generous friends and collaborators. What an incredible gift of trust they extended to me, having no idea what they were getting into. What moments of throwing themselves into the work--the music cue messed up and Dean, a banjo-playing school principal I'd roped in, did the best "Look!--a bird!" maneuver I've ever seen by thrusting himself center stage and doing the Worm. Tyler sang and danced his heart out with a sinus infection and bruised tailbone (fell out of a hammock). Rose and Daniel sang strange laments in made-up language. Micah preached about injury and recovery while sweating bullets and dabbing away with his hankie like the best southern preacher around. Danny Davis rigged clip lamps to the piano so we had a rolling instrument light fixture. GOSH--incredible singer-songwriters contributed original music and sang the Beirut covers and Medieval Spanish songs. It's a lot. It lives in a cheesy, joyous, golden place inside me. It brings to mind words like, "Cornucopia of Blessing," "picnic," "sunset," "Care Bears" and the like. It remains a celebration of generosity, friendship, silliness, of the deep goodness of bringing the material of our lives to the table and cobbling it together into a joyful work. It's the good stuff. It's just THE GOOD STUFF. Okay, I'm gonna stop myself there. It's good to be home in the spring time. Here's a small bit of footage that my mama edited together a while back. Performers: Daniel Bass, Rose Caudle, Holly Evans, Micah Dalton, Helen Hale, Dean Leeper, Tyler Lyle, Billy Mitchell, Gaelyn Powell, Lillian Ransijn. Original Music: Micah Dalton, Holly Evans, Billy Mitchell, Tyler Lyle. More tidbits from the Icebox. Wow. It's been ages. I've been back in Philly for a year now. I've not updated this blog in a year now. But... I'm BACK! And a back log of things to show and share has built up. I reckon I'll begin to dapple this corner of the internet with some images and thoughts, in no particular order (I'm having an interesting relationship to time and chronology, as you might have deduced) from the past year. Here are a couple tidbits from Gem n' I research at the Icebox Project Space in January with the one and only, Maggie Ginestra. More soon. (but then again, what is soon?) XO! I'm back in Philly and back in the studio with the remarkable person, teacher, and dance wizard that is Kun-Yang Lin. So deeply grateful to always find home and family with Kun-Yang Lin/Dancers. Feeling warm and welcome. What a gift! April 10th and 11th I'm collaborating with sculptor, Elwen Hau, as part of SUMPTUARY--a five week series of installation and performance at MINT Gallery. APRIL 10th: IN SITU opens (gallery opens at 5 pm) with 3 Dance Meditations at Dawn (8 pm), Mid-day (9 pm) and Night (10 pm). We'd so love to see you there. SUMPTUARY takes place at MINT Gallery. 636 North Highland Ave., N.E. Atlanta, GA 30306. Go in the red door and down the hall. Playtime with dancer, Alex Abarca, and photographer, Josh Gwyn. Keeping my own sanity in the process of working on this show is, well, quite the task. The hustle is relentless. However, cheery moments of hilarity abound along the way. The latest of these was my promo photo shoot with fantastic friend, Andre Keichian, and the help of my mama, papa, and brother John, all hidden from the view of the camera chucking oranges in all directions. Breaking Ground Residency with the Lucky Penny and Theater Emory! Huge thanks to the Lucky Penny and Theater Emory for inviting me to do a week-long residency in the theater lab at Emory University. I made leaps and bounds of progress on Sanity Ceremonies due to this fantastic support from the performing arts community! Hard to believe it's already mid-August. This spring into summer has been jam packed! In between all my dance work, I've been doing things like: hustling on my gardening jobs, "fixing" my gardening shoes, hitting the admin in an upstairs room recently lent to me as an office, wading through all of the choreographic notes I've made for my upcoming show, drinking coffee, here and there making a card or a flower arrangement, wrapping up teaching my arts course for teenage girls, and going to family reunions. Life is good and full. And quite the balancing act. On into the breach, dear friends! The stools turned out well. Big thanks to ELWENHAUDESIGN and WonderRoot for bringing them into the world. 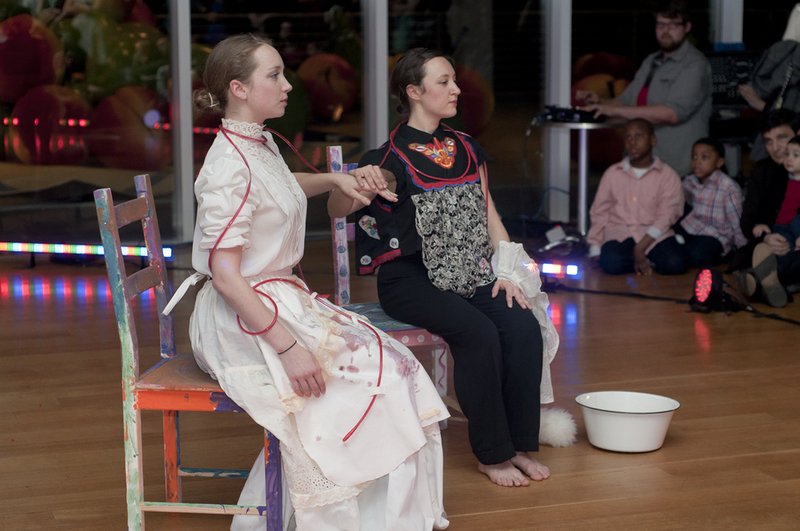 Many thanks to Roni Nicole Henderson for her beautiful images of the performances. I'll have more of those up soon. In the meantime, check out her website to see more of her inspiring work. Click her name below to be directed to her site. Designer and woodworker, Elwen Hau, is making the stools that will be used as a sculptural signpost and front row for my upcoming performance at the opening of the Walthall Exibition this Friday. I went into the shop with him on Saturday to see how it's done. It was like "Reading Rainbow." But in place of LeVar there was just a deep core feeling that something was missing. Watch this "Reading Rainbow" clip on making cakes and pretend they're making stools. Do it. For the past year I've been a part of a professional development fellowship program for artists through WonderRoot Community Arts Center. A couple weeks ago, as part of the culmination of that program, we 11 artists went on a five day retreat to Ga's Ossabaw Island--a place uninhabited by humans outside of a tiny handful of dwellers, island caretakers, and occasional visitors. What a gift to be removed from the city and to be able to decompress, play games, discuss, vision, plan with a group of exceptional artists in what felt and looked like a different world. I kept expecting dinosaurs. We did see multiple alligators, along with hogs, armadillos, herons, storks, donkeys and all manner of other animal life. At night the ocean was phosphorescent. Sculptor Mike Klapthor discovered that one night when he thought to stick his hand in the water while we were out on the peer jammin' to a 60's Motown mix tape on Andre's multicolored kiddo tape player. Somehow the whole trip seems well described by those golden sparks in the dark water. Now we're back in the city and back on the hustle getting ready for the exhibition this coming Friday. I'm falling behind on my blogging here. Too much to update!--which is great. It continues to be a busy spring. 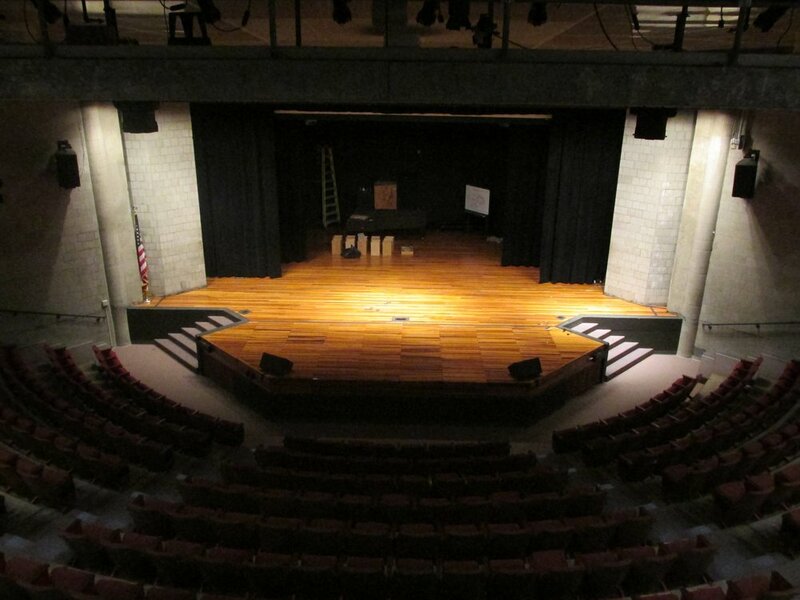 Performing at the High was a fantastic experience. Beth Malone and the High staff took such good care of us. I think Danny Davis has a Mary Poppins-esque bag from which he pulls entire lighting rigs in a couple of hours. Julio and MaryGrace, my fellow dancers, were exquisite. Here are a few images from photographers Christian Moreno and David Batterman. 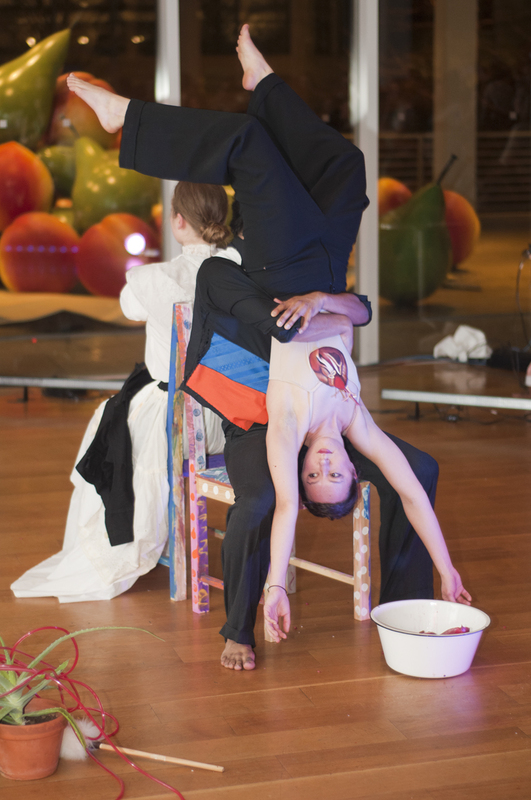 Come out this Saturday evening to the High Museum to see some dance in honor of Frida and Diego. With the help of musical wizardry from Santiago Paramo, costume wizardry from Amanda Baumgardner, and the expert painting skills of Barbara Antonoplos (my mama! ), the dancers and I are bringing the mojo. Prepare your hearts for drama. We perform at 8 and 9. Frida and Diego are coming to the High Museum in February. I'm beginning work on a trio for the High's College Night that happens in conjunction with the exhibition. I imagine it may be a dramatic and colorful holiday season with so much Frida in the house. If you're in Atlanta, stop on by. We'll have lemons and pomegranates. And maybe mariachi. Keep it bold. Keep it bright. Happy December!